Indexes ended today's session mixed. The two main indicators SOFIX and BG40 closed on negative territory. The blue chip index closed below 1,200 points, after losing 0.31% to 1199.85 points. BG40 fell 0.28% to 348.99 points. BGREIT added 0.1% to 95.91 points and BGTR30 rose 0.22% to 816.99. BG40 climbs 1.76% on a weekly basis and BGTR30 ends the week unchanged. SOFIX and BGREIT fell 0.3% and 0.05% for the week. 23 stocks in BG40 advance on a weekly basis. Polimeri was the top gainer among them, adding a little over 1 lev (28.12%) to an average of 4.83 leva. Petrol surged 23.64% to an average of 6.96 levs – a little short of an all time high for the fuel distributor. 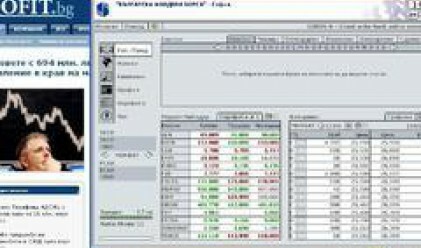 Bulgarian River Shipping AD gained 14.88% to an average of 5.79 leva/share. Lead and Zinc Complex managed to rebound to a certain extent, adding 12.76% to 47.73 leva. Moststroy rose 8.98% on a weekly basis to an average of 117.89 leva and Chugunoleene shares appreciated by some 5.55 leva to 29.22 leva. The company expects to boost production by 53.05% this year. Export will form 88% of this year's sales, according to estimations. This week's list of decliners includes Central Cooperative Bank (-3.01% to 5.47 leva), BACB (-2.87% to 68 leva) etc.